Chasing Sea Gulls on the Beach | God has your back! God’s word tries to prepare us for the magnificence; we read of a place with streets of gold and walls of jasper. We read of a place with no suffering and no pain. We read of a place which is illuminated with the brilliance of the glory of Christ, filled with the songs of praise and adoration of those who have received Him as Lord and Savior. We hear these things and yet we cannot fully grasp the splendor and wonder of what shall one day be. No, it has not entered into the heart of man all that God has prepared for those who love Him. While we don’t fully understand everything, like Haley going to the beach, we know we shall be with One we love and surrounded by others who love us. It will be a glorious place and a glorious time forever and ever and ever! Until we enter that glorious place in the hereafter, the best we can do is praise Him in the here and now. I hope you take the time to find out how much our Lord and Savior loves you. I hope you take the time to read God’s word and prepare for the journey…and every now and then, take the time to chase some sea gulls on the beach. This entry was posted in faith, God, grandchildren, inspirational, what does heaven look like? 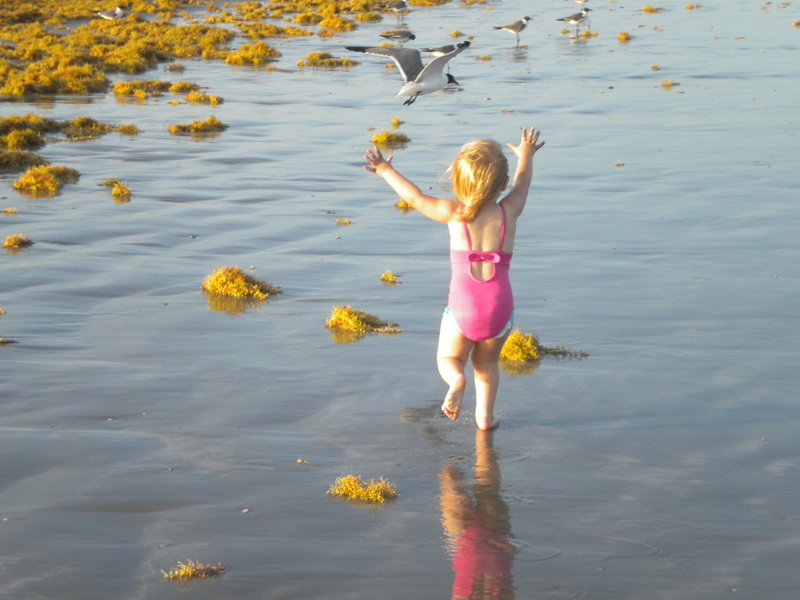 and tagged 1 Corinthians 2:9, chasing sea gulls, faith, God, grandchildren, inspirational. Bookmark the permalink.